As Homo sapiens evolved from hunter-gatherers into farmers, areas along rivers became attractive places to settle. 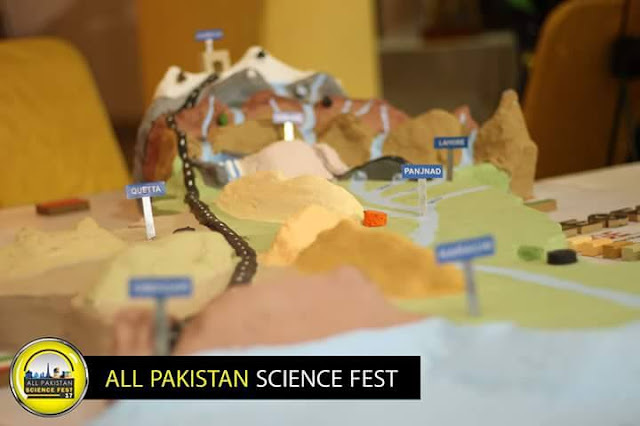 Rivers serve as avenues for transportation and are sources of food, irrigation water, drinking water, power, recreation, and (unfortunately) waste disposal. Further, their ﬂoodplains provide particularly fertile soil for ﬁelds, replenished annually by seasonal ﬂoods. Considering the multitudinous resources that rivers provide, it’s no coincidence that ancient cultures developed in river valleys and on ﬂoodplains. Nevertheless, over time, humans have increasingly tended to abuse or overuse the Earth’s rivers. Here we note four pressing environmental issues pertaining to rivers. 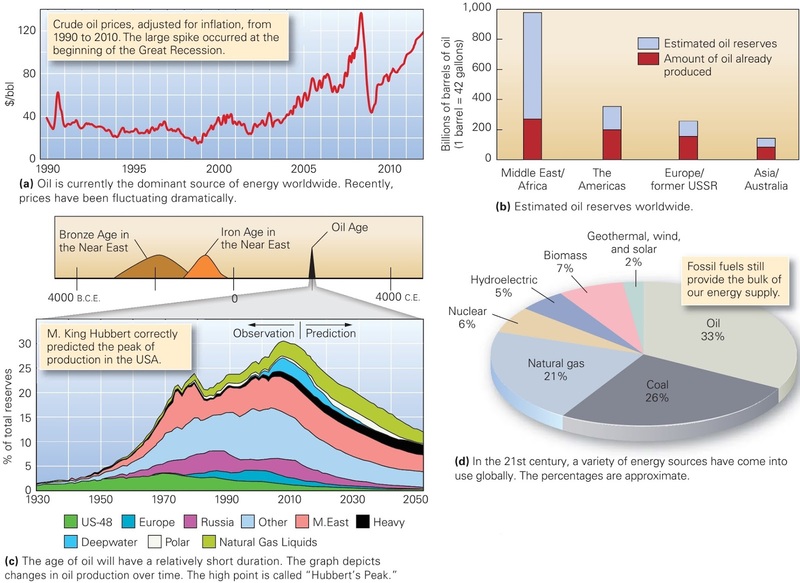 World energy use, cost and reserves. Energy usage in industrialized countries grew with dizzying speed through the mid-20th century, and during this time people came to rely increasingly on oil. Eventually, oil supplies within the borders of industrialized countries could no longer match the demand, and these countries began to import more oil than they produced themselves. Through the 1960s, oil prices remained low (about $1.80 a barrel), so this was not a problem. In 1973, however, a complex tangle of politics and war led the Organization of Petroleum Exporting Countries (OPEC) to limit its oil exports. In the United States, fear of an oil shortage turned to panic, and motorists began lining up at gas stations, in many cases waiting for hours to fill their tanks. The price of oil rose to $18 a barrel, and newspaper headlines proclaimed, “Energy Crisis!” Governments in industrialized countries instituted new rules to encourage oil conservation. During the last two decades of the twentieth century, the oil market stabilized. Since 2004, oil prices rose overall, passing the $147/bbl mark in 2008; but the price collapsed in late 2008 when the Great Recession hit. More recently, the price has hovered around $100/bbl (figure above a). Will a day come when shortages arise not because of politics or limitations on refining capacity, but because there is no more oil to produce? As highly populous countries such as China and India industrialize, the use of fuels accelerates. To understand the issues involved in predicting the future of energy supplies, we must first classify energy resources. As noted earlier, we call a particular resource renewable if nature can replace it within a short time relative to a human life span (in months or, at most, decades). A resource is non-renewable if nature takes a very long time (hundreds to perhaps millions of years) to replenish it. Oil is a non-renewable resource, in that the rate at which humans consume it far exceeds the rate at which nature replenishes it, so we will inevitably run out of oil. The question is, when? What Are Oil and Gas? For reasons of economics and convenience, industrialized societies today rely primarily on oil (petroleum) and natural gas for their energy needs. Oil and natural gas, both fossil fuels, consist of hydrocarbons, chain-like or ring-like molecules made of carbon and hydrogen atoms. Chemists consider hydrocarbons to be a type of organic chemical. Some hydrocarbons are gaseous and invisible, some resemble a watery liquid, some appear syrupy, and some are solid. The viscosity (ability to ﬂow) and the volatility (ability to evaporate) of a hydrocarbon product depend on the size of its molecules. Hydrocarbon products composed of short chains of molecules tend to be less viscous (meaning they can ﬂow more easily) and more volatile (meaning they evaporate more easily) than products composed of long chains, because the long chains tend to tangle up with each other. Thus, short-chain molecules occur in gaseous form (natural gas) at room temperature, moderate-length-chain molecules occur in liquid form (gasoline and oil), and long-chain molecules occur in solid form (tar). 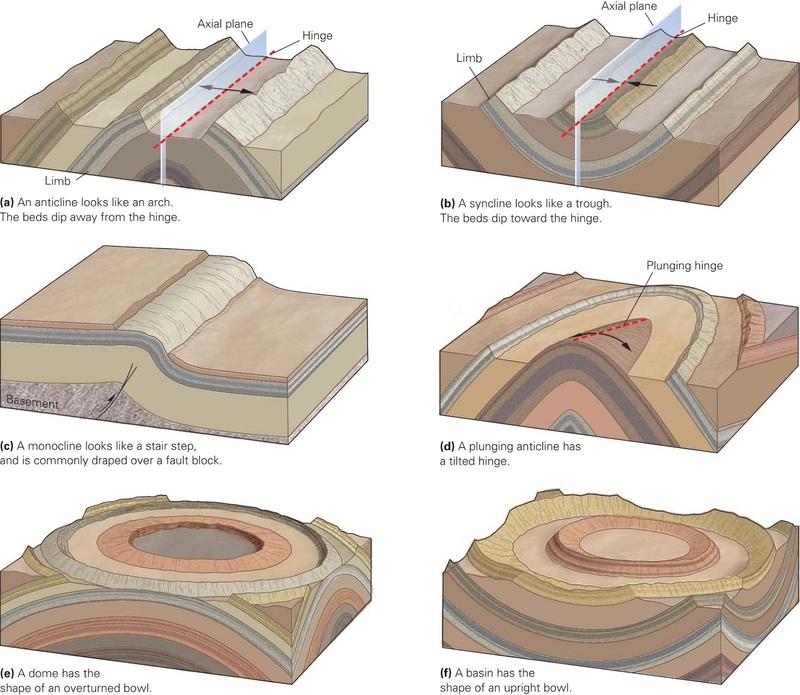 We can summarize information about the sequence of sedimentary strata at a location by drawing a stratigraphic column. Typically, we draw columns to scale, so that the relative thicknesses of layers portrayed on the column reﬂect the thicknesses of layers in the outcrop. Then, we divide the sequence of strata represented on a column into stratigraphic formations (“formations,” for short), a sequence of beds of a speciﬁc rock type or group of rock types that can be traced over a fairly broad region. The boundary surface between two formations is a type of geologic contact. 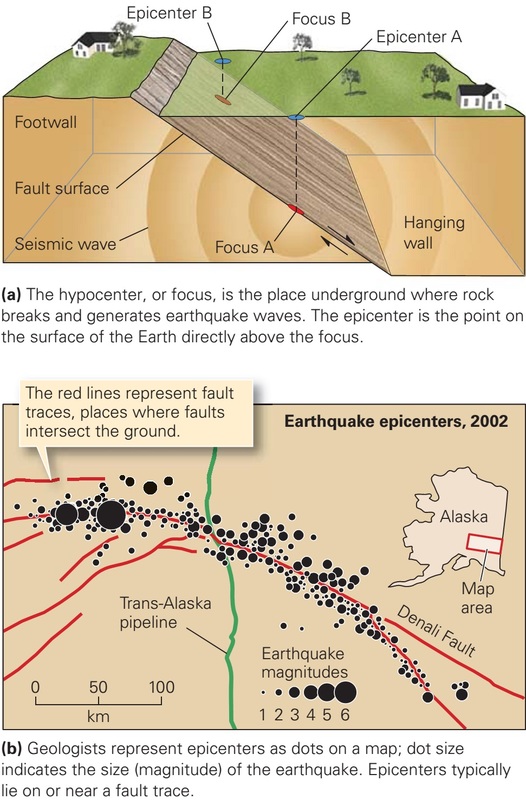 (Fault surfaces and the boundary between an igneous intrusion and its wall-rock are also types of contacts.) 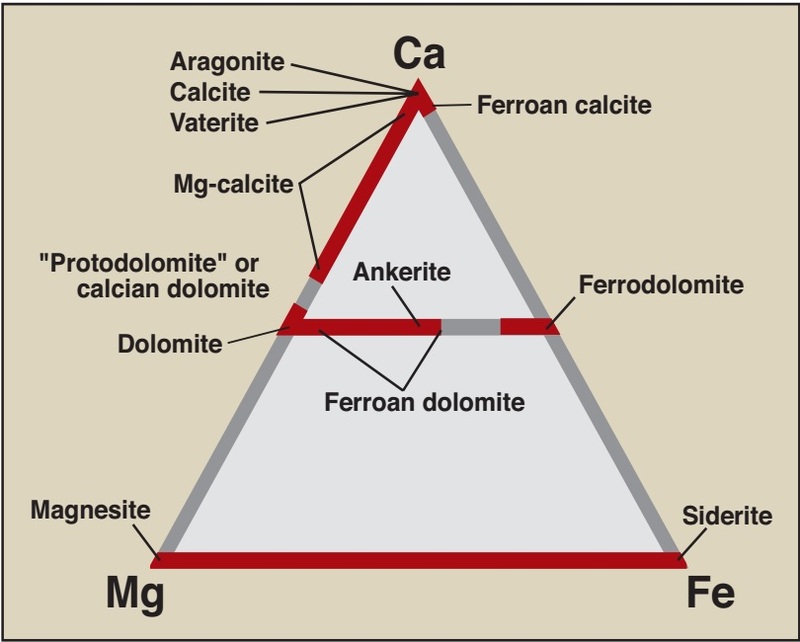 Typically, a formation has a speciﬁc geologic age. The stratigraphic formations and stratigraphic column for the Grand Canyon in Arizona. Global correlation of strata led to the development of the geologic column. As stated earlier, no one locality on Earth provides a complete record of our planet’s history, because stratigraphic columns can contain unconformities. 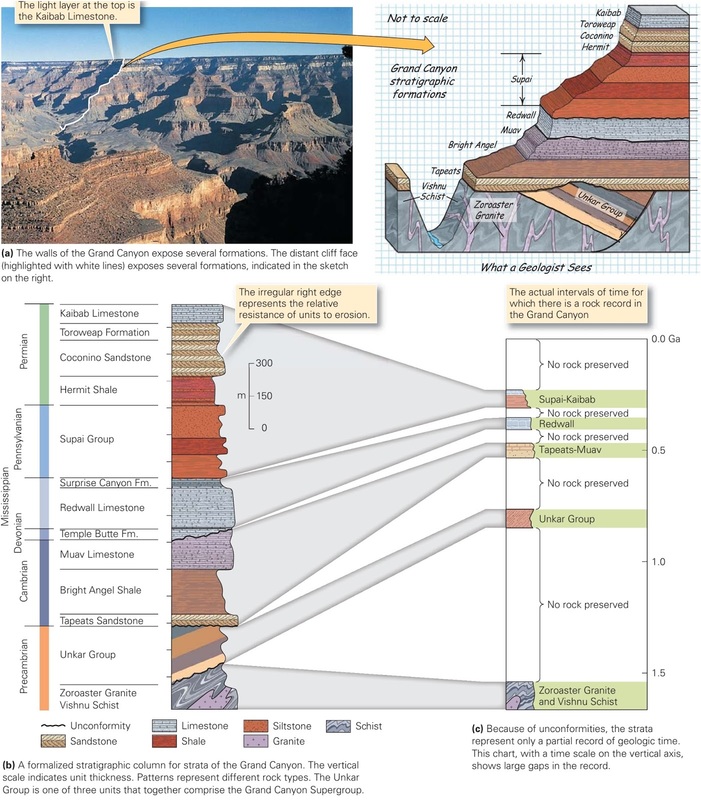 But by correlating rocks from locality to locality at millions of places around the world, geologists have pieced together a composite stratigraphic column, called the geologic column, that represents the entirety of Earth history (figure above a, b). The column is divided into segments, each of which represents a speciﬁc interval of time. The largest subdivisions break Earth history into the Hadean, Archean, Proterozoic, and Phanerozoic Eons. (The ﬁrst three together constitute the Precambrian.) The sufﬁx zoic means life, so Phanerozoic means visible life, and Proterozoic means ﬁrst life. (It wasn’t until after the eons had been named that geologists determined that the earliest life, cells of Bacteria and Archaea, appeared in the Archean Eon.) The Phanerozoic Eon is subdivided into eras. In order from oldest to youngest, they are the Paleozoic (ancient life), Mesozoic (middle life), and Cenozoic (recent life) Eras. We further divide each era into periods and each period into epochs. The unconformity at Siccar Point, Scotland. To ﬁnd good exposures of rock, James Hutton sometimes boated along the coast of Scotland, where waves of the stormy North Sea have stripped away soil and shrubbery. He was particularly puzzled by an outcrop at Siccar Point, where two distinct sequences of sedimentary rock lie in contact (figure above a, b). In the lower portion of the outcrop, beds of gray sandstone and shale dip nearly vertically, whereas in the upper portion, beds of red sandstone and conglomerate display a dip of less than 20 degree. Further, the gently dipping layers seem to lie across the truncated ends of the vertical layers, like a handkerchief lying across a row of books. We can imagine that as Hutton was examining this odd geometric relationship, the tide came in and deposited a new layer of sand on top of the rocky shore. With the principle of uniformitarianism in mind, Hutton suddenly realized the signiﬁcance of what he saw. The gray sandstone-shale sequence had been deposited, turned into rock, tilted, and truncated by erosion before the red sandstone–conglomerate beds had been deposited.